Erich Schweikher's first real kiss was on a bike. He and his bike toppled over during the kiss, and drama, blood, bruises and a quick breakup unfolded from the episode. Now, years later, his love affair with cycling has led him to create Cycling's Greatest Misadventures a book that presents twenty-seven of the most intriguing, terrifying, bizarre and comical stories from cycling die-hards worldwide. Schweikher and coeditor, Paul Diamond, spent a year gathering these true stories from bicycle aficionados, journalists, magazine editors, professional racers, and everyday cyclists. These riders share the episodes when they've found themselves in over their heads, facing danger and the unexpected. The writing is economical and fast paced in these collected stories which take the reader on a gripping ride through the uncharted terrain of freak accidents, animal attacks, sabotage, idiotic decisions, eerie events, and other jaw-dropping, adrenaline-pumping calamities. Each story brings to life the strange possibilities that await cyclists once they step on the pedals of a bike. In Australia, a former pro cyclist decides to spread tacks on a women's race course in an attempt to get a date. In Pennsylvania, a man accidentally cycles deep into a prison yard and then has to make an escape. In 1897, twenty African-American's complete the first group Transamerican ride (Missoula, MT to St. Louis) on iron bikes with wood rims, and they all ride armed with rifles. In Washington DC, a woman is attacked by a large rat that jumps on her bike and slaps her repeatedly with its tail. In North Carolina, a man is "attacked" and knocked from his bike by a flying, dead dog. Some of these stories might make your cringe or laugh; most will make you shake your head with disbelief. 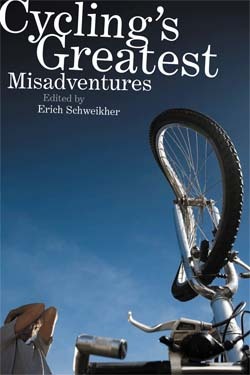 Schweikher and Diamond's selection often goes beyond thrills and spills, as it explores the culture and psychology of cyclists. There's something remarkably moving about cyclists reflecting on and writing about how they got themselves into deep in trouble. In the end the stories in this book stay with you, and you find yourself repeating them to friends. See www.thebikebook.com for media kit and more information. Got a wild Cycling Story? Submit it for publication!